Some 15 years ago, when Palm Coast officially became a city, the city’s administration had no office. No desks nor phones. Jim Canfield, Mayor at the time, operated out of a coffee shop said city historian and director of the Palm Coast historical Society, Art Dycke. Since 1999, the City of Palm Coast has occupied five different buildings and has never really had a home of its own. That is about to change. In October of last year, Palm Coast City broke ground on the city’s first ever City Hall – a 41,000 square-foot masterpiece that overlooks Central Park in the Town Center of Palm Coast. 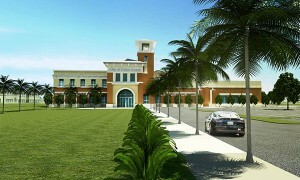 Until recently, the Palm Coast City Hall project was to be carried out in two phases. Although there were concerns at first, it was decided that including the $2.5-million community park wing into the first phase of construction will save the city over $1 million in the long run. Even with the changes, the project has suffered no delays in construction. Work on the City Hall building has progressed nicely since that sunny day in October. As of early April, the project was about 30% complete, and citizens who pass by the location will see that most of the walls of the structure have already been erected. “Our new city hall will become our symbol of friendship and diversity, connecting public servants to Palm Coast, the community that we love, the place where we always count on each other in very special ways,” said current Palm Coast Mayor Jon Netts. Getting the project approved, however, was a rough road. In 2005, the citizens of Palm Coast resoundingly turned down the idea of a new town hall. The city found a way, through hard work and fortunate financial maneuvering, to build the facility without the use of tax money. “I think the turning point was when we finalized a plan that wasn’t dependent on tax dollars,” said Netts. By using a $5.8 million repayment loan from the Town Center Redevelopment Area (CRA), the city was able to cover the majority of the cost. And, because this site will be the location of Palm Coast’s new downtown, future property owners have paid for most of the construction costs. “I think the time is right for a place for the city to call home,” said City Councilman Dave Ferguson. The project’s design was completed by C.T. Hsu + Associates and construction is being managed by the Gilbane Building Company. The building is expected to be completed in late 2015 or early 2016. Keeping up to date with Palm Coast and Flagler County news is important to local residents and real estate professionals. Whether you’re looking for more information about life in the Sunshine State or to buy or sell your Palm Coast home, you can depend on the ParkSide Realty Group to ensure you’re well taken care of. Contact us today and let us know how we can help!